The Soviet Premier, Joseph Stalin, had given clear orders: Soviet pilots would connect Moscow with the farther corners of the Soviet Union. Two male pilots had flown 6,850 miles, non-stop from Moscow to the Far East and were declared heroes. After that successful flight and the ensuing press, Stalin ordered Soviet women to make a similar trip. Three of the best and most experienced were chosen and given a specially-built aircraft, a modified Tupelo DB-2B, called the ANT-37 “Rodina”, which means “Motherland” in Russian. Like the men’s flight, it was a serious state-sponsored mission. Stalin selected Valentina Grizodubova as the Commander of the flight. Valentina was one of the Soviet Union’s very first female pilots and the daughter of an aircraft designer, who had her flying since the age of 14. She had amassed a total of 5,000 hours of flight time. Valentina, the perfect Soviet citizen, was also a concert pianist and a member of the Soviet paramilitary organization called Osoviakhim. The co-pilot was Polina Osipenko, the daughter of a Ukrainian farmer. She had to fight to get the right to fly and finally soloed in 1933. Polina worked long hours training and flying and by 1937, she had emerged as a celebrated Soviet aviatrix with 3 records: 2 for altitude and 1 for distance on a closed circuit. As the navigator, Stalin chose Marina Raskova, a trained singer and musician. She had been the Soviet Air Forces first woman navigator and had quietly worked for the NKVD, the Soviet Secret Police. They were the perfect, hand-selected flight crew for the mission. The women took off on September 24, 1938 and had flown a full day and through the night. The clouds and turbulence forced them to fly at higher altitudes than planned. Finally, they located the shores of the Sea of Okhotsk. They turned around and flew back over land, and found nothing but forests and swamps. Nothing on their meager charts matched any landmarks they could find, but Raskova still managed to roughly locate their position. Radio navigation aids were non-existent and they had no fuel to fly a box search pattern to find a town or village, let alone anything of interest. Their radios were knocked out from the night before when the cabin temperatures had fallen to -35 degrees Celcius. Fuel was getting low and time was running out. Everything that was expendable was thrown out to lighten the load. At 6,500 feet, Raskova bailed out herself. She had to descend into the forests and then find her way to the imminent crash site on foot. She left her emergency kit and supplies and didn’t even have a compass. There was nothing for her to do but set out in the direction she had last seen the plane fly as it disappeared in the distance. Grizodubova and Osipenko descended slowly and searched for the best option that didn’t include trees. They found a half frozen swampy area and prepared for a landing. They set down and damaged the plane but the two of them were uninjured and able to climb out. All they knew of their location was that they were somewhere in the Far Eastern reaches of Siberia. They elected to remain with the plane and hope that search teams would find them. Raskova wandered the forest alone for ten days before coming upon the plane. She survived despite having no water and only two chocolate bars. She found the plane just two days after a Soviet search aircraft had located the wreckage and had dispatched ground rescue. The three pilots were eventually picked up, taken to the nearby village of Kirby, then brought back to Moscow. As it happened, the “Rodina” had flown 3,672 miles in 26 hours and 29 minutes, a new record for an all-woman flight crew. All three pilots would be celebrated as heroes of the Soviet Union (the first time any women had been so honored and the only ones to receive that award prior to World War II). Additionally, each received a reward of 25,000 rubles for their loyal service to the Soviet ideal. A year later, Polina Osipenko died in an accidental plane crash. The village of Kirby and surrounding district was renamed in her honor, a name that it retains to this day – P.Osipenko. Marina Raskova went on to form the famous WWII all-women night attack regiment called “The Night Witches”. She died in operations during the war against Nazi Germany. Valentina Grizodubova was the only one to survive the war. She saw the flag go down on the Soviet Union and the end of Stalin’s dream of Soviet socialism. She passed away in 1993 at the age of 83, in Moscow. 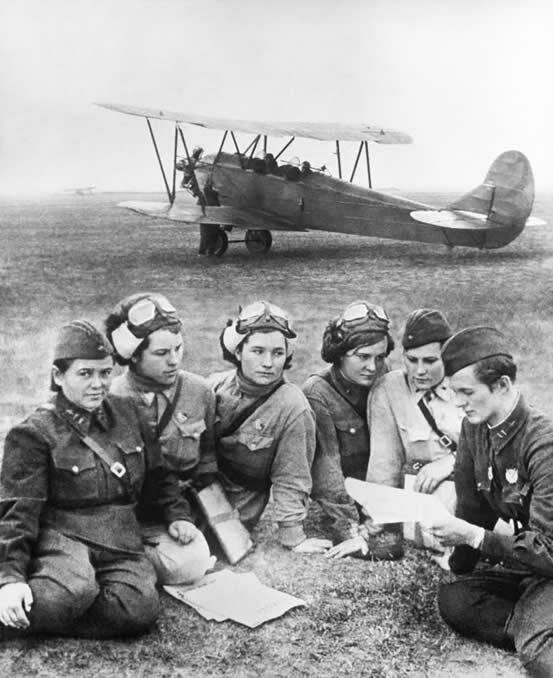 The Germans named the Soviet female pilots in the 588th Night Bomber Regiment the “Night Witches” because of the whooshing noise their plywood and canvas PO-2 aircraft made when they pulled the power back, lowered the nose of the plane and made a bombing run in the dark of night. It reminded them of the sound of a witch’s clothing with riding her broomstick. The women proudly accepted the name. After receiving the Hero of the Soviet Union medal for the “Flight of the Rodina,” Marina Raskova was highly successful in lobbying for women to take a more active role in the war. Her efforts lead to women becoming eligible for the draft and she even convinced the military to establish all-female units. Soviet Premier Joseph Stalin issued an order in 1941 to establish a trio of all-female air squads. The 588th Night Bomber’s Regiment was the only one to remain exclusively female and their ages ranged from 17 to 26. Wearing men’s boots and uniforms, the women cut their hair short and came to the realization that the biggest obstacle, before engaging in combat, would be with the equipment. They flew the Polikarpov PO-2, a two seated, open-cockpit biplane that was obsolete even by the standards of the day. Made of plywood and canvas, the planes were light, slow, and provided absolutely no armor. There were a few benefits, though. The planes had a slower stall speed than the standard German fighters, which made them hard to target and they could take off and land just about anywhere. On June 8, 1942, the all-female squadron started their first overnight bombing run and continued until the end of the war. They had no parachutes, no guns, no radios or radar, only maps and compasses. If hit by tracer bullets, their planes would burn like sheets of paper. Forty two-person crews, flying multiple bombing runs as soon as the sky darkened, took part in as many as 18 runs in a single night. The planes carried six bombs at a time, so as soon as one run was complete, the pilots would be re-armed and sent back for another run. Flying in the open-cockpit planes in subzero temperatures often gave the women frostbite. By the end of the war the Night Witches had flown 30,000 bombing raids, delivered around 23,000 tons of munitions, and had lost 30 pilots. Twenty three femals pilots were awarded the title of Hero of the Soviet Union. Marina Raskova fought for women to have a place in the war and contribute as much as the men. She died on January 4, 1943, when her aircraft crashed while attempting to make a forced landing on the Volga bank, as she led two other PO-2s to an operative airfield near Stalingrad. Marina received the first state funeral of the war. Her ashes are buried in the Kremlin Wall, next to Polina Osipenko’s, on Red Square. Marina Raskova, the Flight of the Rodina navigator and mastermind of the Night Witches, is a highly honored and revered female in Soviet history. Nadezhda Popova, one of the most famous and honored Night Witches, died on July 8, 2013…the day before Nikki Mitchell.